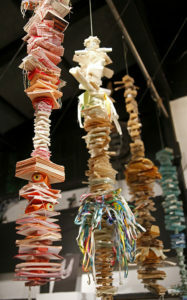 Daniella Woolf’s colorful “totems” made from mundane household objects hang throughout the gallery. When assembled, these totems “explore tensions between order and chaos” and “celebrate pattern.” Photo by Calyse Tobias. On the outskirts of the Felix Kulpa Gallery and Sculpture Garden sits Michael Leeds’ “Junk-yard angel,” a motorcycle-shaped sculpture composed entirely of found materials. Leeds uses scrap metal he collects and melds himself, but also incorporates miscellaneous household objects such as toasters, vacuum cleaners and ice cream scoops into his pieces. The sculptor’s work has been featured at Felix Kulpa in previous years and continues to live on in the garden. The gallery itself is small, almost invisible behind neighboring Streetlight Records. On the first Friday evening of every month, the gallery and many private spaces across the city — Berdel’s, Cafe Delmarette and the Museum of Art and History, to name a few — open their doors to the local arts community. Last Friday was no exception, as hula dancers performed in the street, bands play jazz music on the corners and local art lovers walked up and down Pacific Avenue. The First Friday Art Tour was established in 2004 by Santa Cruz Institute of Contemporary Art Director Kirby Scudder and community members invested in creating more accessible public gallery spaces. Restaurants and retail stores give local artists the opportunity to showcase their work, which in turn bolsters their business. It costs $25 for artists to register for the full year of events, and $60 for businesses to register monthly. Scudder has worked on similar gallery projects at the Tannery Arts Center to better integrate the local arts community into the greater Santa Cruz community. According to the event’s organizers, 35 businesses and galleries participated this month. Inside the gallery, Daniella Woolf greeted visitors of her exhibition, “High Strung,” with an eager chattiness. Woolf’s jewelry pieces and sculptures are created with found objects like bank statements, checks and postcards to represent a more traditional way of doing things. She preserves them through constructing “totems,” a series of objects previously belonging to her family and friends, which she arranges vertically on string and hangs as mobiles. “It’s interesting to honor these things that were once so important to us in terms of commerce that now are outdated,” Woolf said. Robert Zacuto, the father of Woolf’s best friend in high school, created and sold bright Hawaiian-themed muumuus. After Zacuto died, Woolf used the muumuu’s fabric to craft the totems, altering the dress’s traditional function by transforming it into an archive of personal histories. “[Zacuto] came to the USA as a Turkish immigrant [and] learned dress pattern-making in New York,” Woolf said. “As a frugal immigrant [who lived] through the Great Depression, he kept everything”. 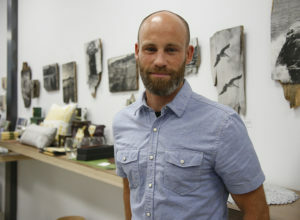 Farther down Pacific, painter and photographer Jared Leake showcased his work in Agency, a home goods store. For his exhibit, Leake displayed polished wood, each with a different black and white photo transferred onto its surface. Leake first painted on Masonite panels, but later experimented with transferring photos onto the pieces of wood. While in Scanclos, Greece, he collected wood from a 200-year-old table and took photos of the village where he stayed. He later created a piece that incorporated his photography and the wood table, effectively fusing their histories together and creating a new one. In the 11 years First Friday has operated, it has opened up opportunities for Santa Cruz residents inside and outside the arts community to learn from one another, artistically and personally. First Friday events are not a new development for art communities in the U.S., but Santa Cruz’s is important for both residents eager to support local art and businesses and for artists looking to collaborate, share their work and further their careers. Artists like Leeds, Woolf and Leake will continue to ask the difficult and sometimes impossible questions, and they can take comfort in knowing they will always have an audience in town to listen. December’s First Friday Art Tour will take place throughout the downtown area on Dec. 4 from 5 p.m. – 9 p.m.